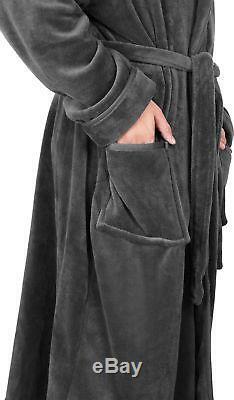 NY Threads Luxurious Men's Shawl Collar Fleece Bathrobe Spa Robe (Grey, L/XL) - Pack of 12. Super soft, plush, shawl collar fleece bathrobe made from flannel fleece that offers great comfort whenever in use; perfect for lounging, relaxation and a great choice to wear after a tiring day at work. The bathrobes are soft, fluffy and super-absorbent, which can be worn all day long; the bathrobe carries a classic design, making it ideal for everyday usage. Each bathrobe features an adjustable waist belt that assists in securely closing the robe from the front so that you can wear it with confidence; the two front pockets give you the option of keeping frequently used items in it when it's worn for a good part of the day. A total of 2 sizes are available in grey and navy color so that you can make the right choice accordingly. Machine washable material allows for easy care of the bathrobe; machine wash in warm and tumble dry on low. 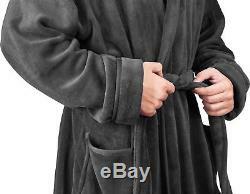 Ultra-Soft, Plush Polyester Flannel Fleece Mens Bathrobe. NY Threads bathrobes are made from the highest quality flannel fleece for utmost comfort. The soft and fluffy nature of the bathrobe enhances the user experience by far so that you can have it on for a prolonged period. 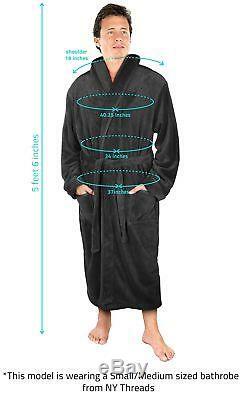 No matter what your day has to offer, you can start and end it in comfort with these full-length robes in use. So wear it after taking a shower, before going to bed, etc. Shawl Collar: It gives a stylish look to the robe, making it portray a very classy look when put on. 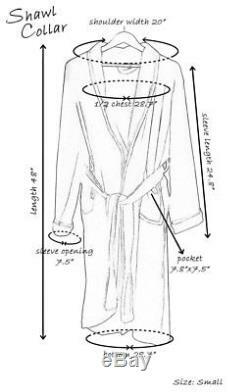 Front Pockets: Two front pockets for holding frequently used items like cell phones especially when the bathrobe is put on for long. Waist Belt Closure: The adjustable waist belt helps in securely closing the robe from the front so that it can be worn with confidence. Machine wash the bathrobe in warm water and tumble dry on low heat setting. Wash the bathrobes separately from your other washables and do not forget to remove the bathrobe's belt before washing it. Avoid the bathrobe's contact with skin care products as they are likely to leave stain marks on the bathrobe. While washing the bathrobe, please refrain from using fabric softeners and bleach as it may damage the bathrobe's fiber. Add half a cup of disinfected white vinegar to remove any detergent build up along with lint. If you see a pulled thread or loop, it is advised to cut the loop using a pair of scissors. Small/Medium: Length: 122 cm, Shoulder: 51 cm, Chest: 146 cm. Large/X-Large: Length: 126 cm, Shoulder: 51 cm, Chest: 154 cm. Any product you return must be in the same condition you received it and in the original packaging. We usually respond within 24 hours on weekdays. Thank you for shopping at our store. The item "NY Threads Luxurious Men's Shawl Collar Fleece Bathrobe Spa Robe Grey L/XL" is in sale since Sunday, October 21, 2018. This item is in the category "Clothing, Shoes & Accessories\Men's Clothing\Sleepwear & Robes". The seller is "jamonsater" and is located in Joliet, Illinois. This item can be shipped to United States, Canada, United Kingdom, Denmark, Romania, Slovakia, Bulgaria, Czech republic, Finland, Hungary, Latvia, Malta, Estonia, Australia, Portugal, Cyprus, Slovenia, Japan, China, Sweden, South Korea, Taiwan, South africa, Belgium, France, Hong Kong, Ireland, Netherlands, Poland, Spain, Italy, Germany, Austria, Mexico, New Zealand, Switzerland, Norway, Saudi arabia, Ukraine, United arab emirates, Qatar, Kuwait, Bahrain, Malaysia, Brazil, Chile, Colombia, Costa rica, Panama, Trinidad and tobago, Guatemala, Honduras, Jamaica.